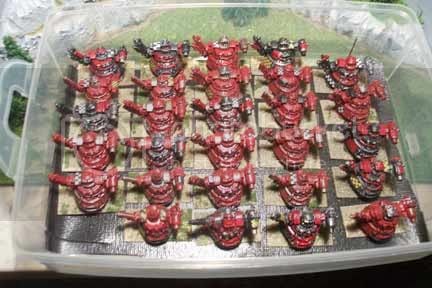 Forum Index › Games Workshop Misc. Okay, time to start sharing some piccies of the Epic minis I've been able to gather. I started getting back into Epic a couple of years ago, and I've managed to score almost this entire collection for around $300 by swinging a lot of trades and finding a couple windfall deals on Bartertown and elsewhere. I was thoroughly discouraged by the mountain of minis I seemed to have acquired, so I began to sort them into point-sized units. I drew up some box templates and printed them on heavy cardstock, then cut and taped them over several evenings whilst enjoying some episodes of Battlestar Galactica, courtesy of Netflix. 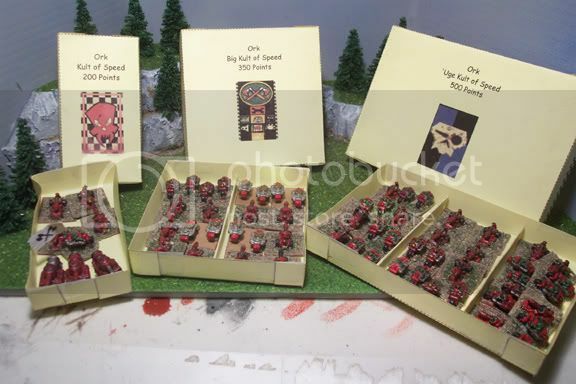 The nice thing about this is, if I want to pull out, say, a 2,000 point force, I just reach in and grab the boxes I need, as I've labeled them with the point values. For some of the collector's pieces, I've included the stats as well, right inside the box. 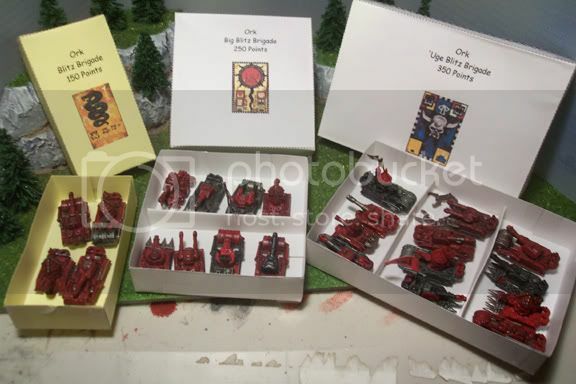 The Orks, having their three-tier system of force organization, have three sizes of boxes, obviously. Inside some of them I put dividers to reinforce the boxes and make it easier to pull out part of a force if necessary. 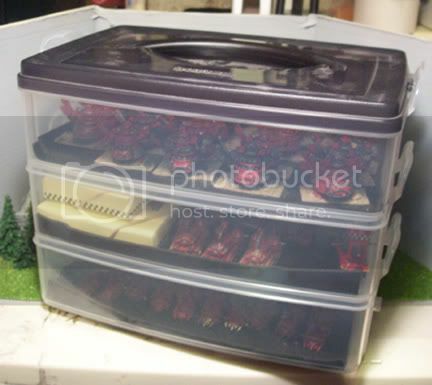 I at first wanted to make hinged boxes, but I found as I went along that boxes with separate lids were easier to make and manage. 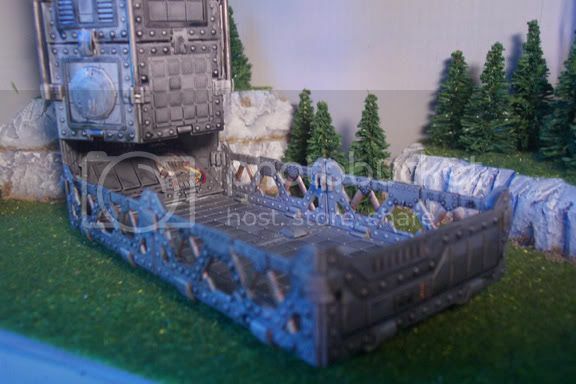 In my search for blast markers that were 1) nice looking and 2) affordable (as I'm notoriously chea- er, thrifty), I hit upon the idea of using some of the many Mechwarrior bases that I had lying around after popping the vehicles off of them. Combine those with the excellent Litko Aero blast markers, and I have markers that can represent from 1 to 12 blast markers each. I designed and printed my own dials, which I pasted on underneath. The numbers could stand to be bigger and located higher on the dial, though. I may print them anew. 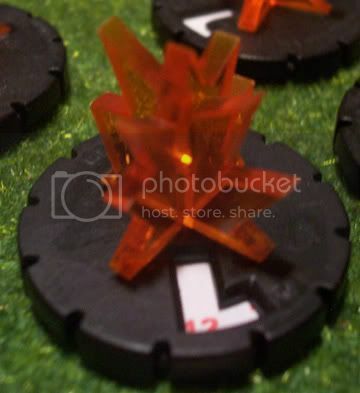 12 blast markers... that guy's in real trouble. They look pretty good on the tabletop, too. Not as impressive as having a handful of the paper ones strewn about, but better than nothing. 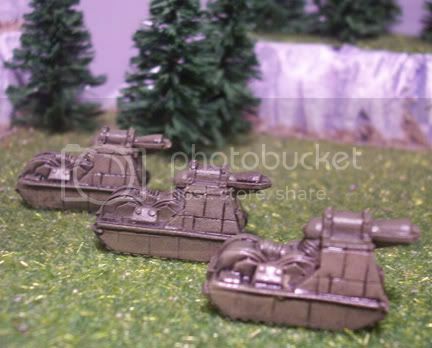 Of course, I'm biased, as I'm the one who suggested making blast markers to Litko a couple years ago, during a discussion on Theminiaturespage.com. My little slice of history. I have tons of Orkses, thanks to a couple windfall purchases I made. 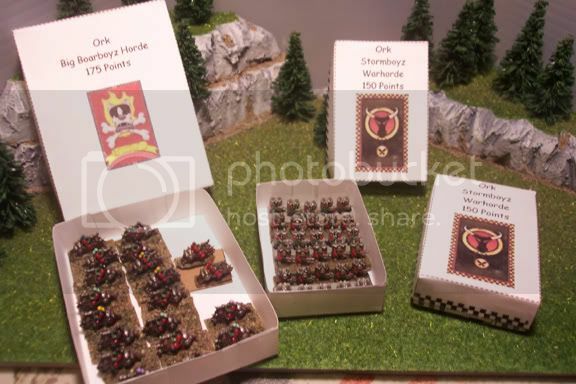 I probably haven't spent more than $120 on my orks, but I have easily in excess of 12,000 points, including proxies and scratchbuilds. One guy on RPG.net sold me a huge pile of OOP metals for not much at all. Thanks, Komradebob! Here's the boxes. 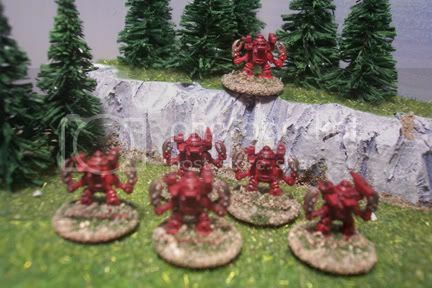 Sadly, my crappy 6-year-old digicam didn't render the pics of the actual minis very well, so I'll have to take that again. And... well, I think I may have a bit too many Gunwagonz. In addition to this stack, I found another box of four. 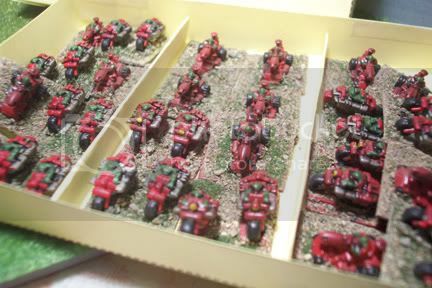 As part of that incredible haul from RPG.net, I landed some of those great old Orky vehicles -- Lifta-Droppas, Rokkit Speedstas, Dragstas, Kannon Speedstas, Bubble-Chuckas... Good stuff. 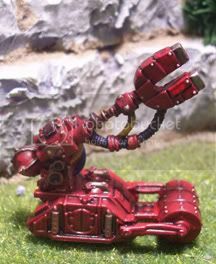 For when I want my Boyz to be mechanized. I'd didn't bother making boxes for the Stompa Mobz. I have 28 Stompas, which would mean a lot of little boxes. 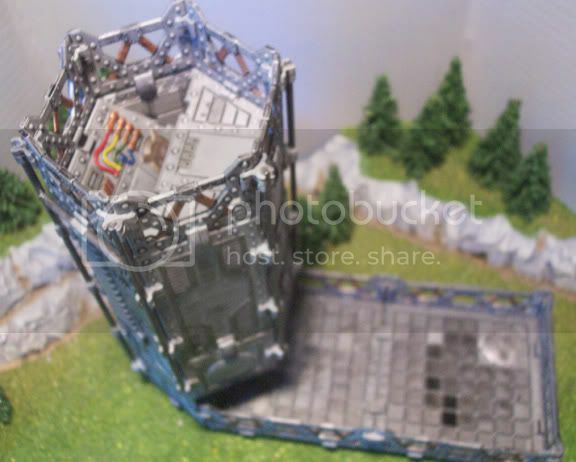 And here's my scratchbuilt Battlefortress. As you can see, it's way too big, but at the time I made it, I didn't own any to compare it with. 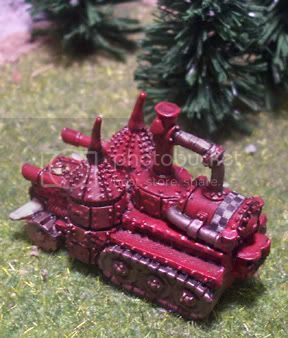 The chassis is an A&A Minis Flammenpanzer. Haven't made a box for them yet, either. Yeah, I know these just count as "Big Gunz" now, but I still like them. 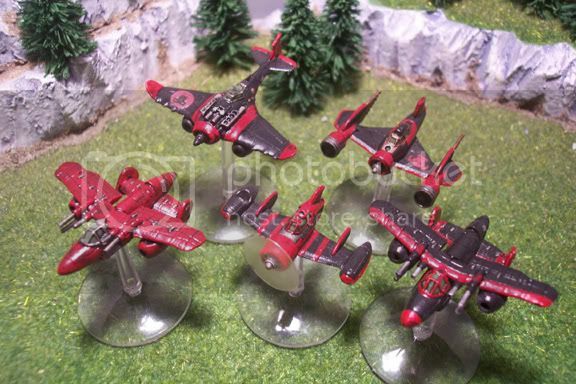 Being chea-- er, thrifty, I didn't want to spend money on actual GW pieces, so when I found these Crimson Skies fighters at Merlyns for around half-price, I couldn't resist. The jet engines are actually wooden beads from Michaels. 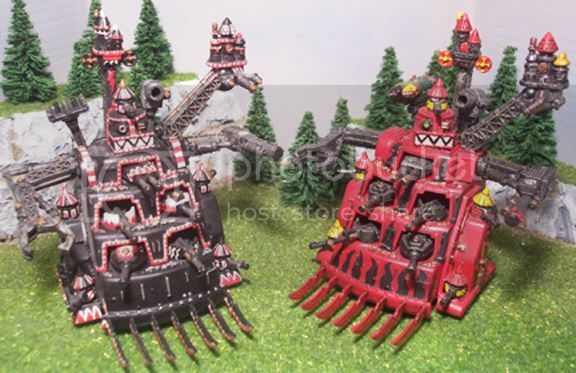 I was glad when the Swordwind rules gave the Boarboyz back their dignity. Such as it is. You'll also notice my Stormboyz in that same pic. I haven't flocked the bases yet, and I still need to paint up the gazillion stands of Nobz I've got, so they aren't here for morning muster. Maybe next weekend. 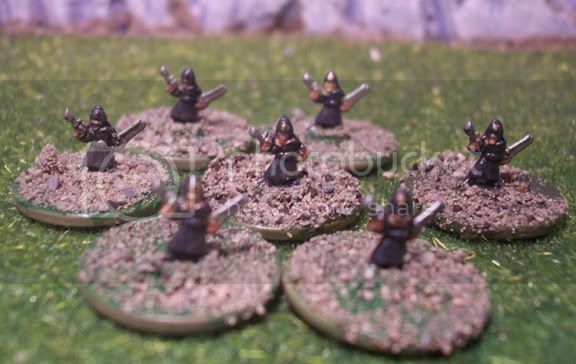 When I first started basing my minis, I didn't have very many, and I wanted to make them stretch. 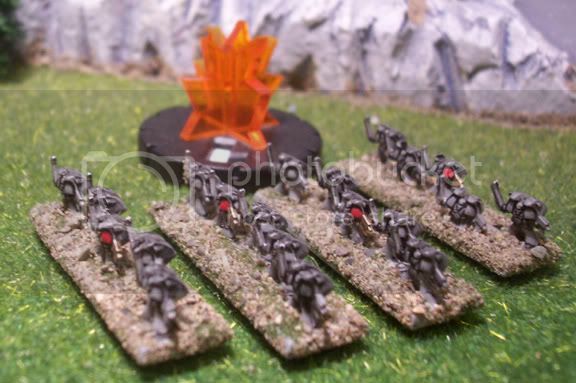 So, I started basing them with two warbikes to a stand on 20mm x 20mm cardstock pieces. Later, when I made out like a bandit, I found myself swimming in bikes. So, as a consequence, I can field three Kults of Speed, one in each size. Da fat boyz is here! I got these Mega-Gargants for $5 each from a guy on Bartertown. Not often you see deals that good over there. 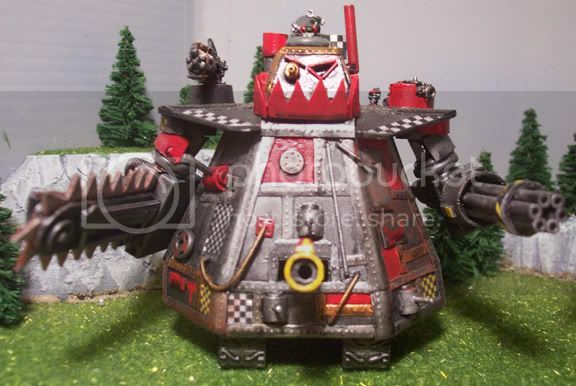 Some of you have already met my own scratchbuilt one. Here he is again! My total force of Orks fills seven of those trays. My Marines fill three, and my IG fills five (one dedicated solely to Warlord Titans). I love the IG, but that's probably because I was a grunt myself, once upon a time. I also love the many different flavors that IG regiments come in. 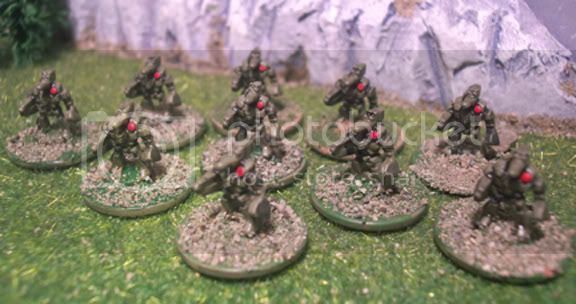 Tallarn, for that Lawrence of Arabia feel; Mordian Iron Guard; Praetorian XXV ('cause Zulu-style combat seems to fit the 40K mold); Cadians; Catachans; Elysians; I love them all. Except those goofy Nutcracker Suite Vostroyans. I shudder at the thought. 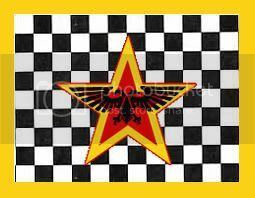 For my Guard, I wanted to go with a WWII Soviet-style theme; green uniforms and red stars everywhere. 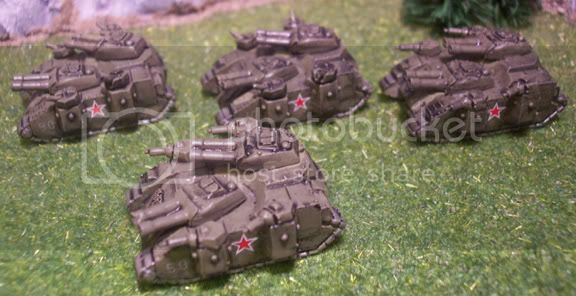 Sadly, a lot of the IG equipment lacks flat surfaces on which to put red star decals, but I did my best. The decals I used, by the way, were from I-94 Enterprises. 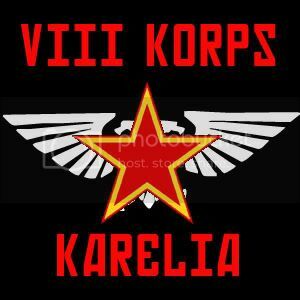 My forces are from the Karelian VIII Corps. 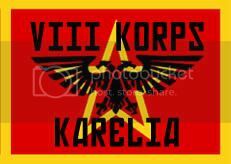 Karelia is a world of vodka, borscht, strong women with hot accents, and black-coated political officers shooting everyone suspected of even being able to spell the word "heresy". 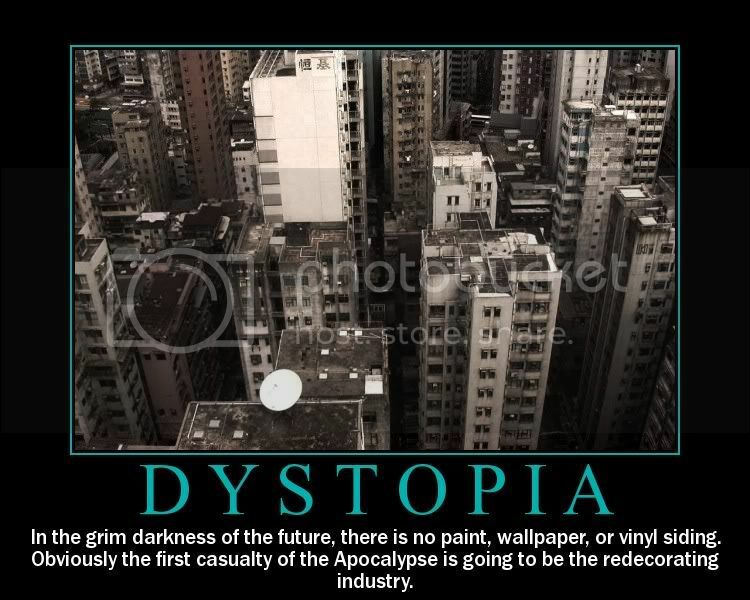 In short, a typical dysfunctional 40K dystopia. I whipped up some graphics in Photoshop to use as banners and whatnot. I like banners. I need to get better at putting them on stands and tanks, though. 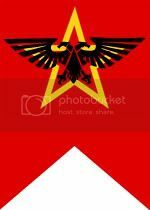 I normally print them on regular printer paper, but I'd like to find, I don't know, silk or something which would make a nice draped flag. 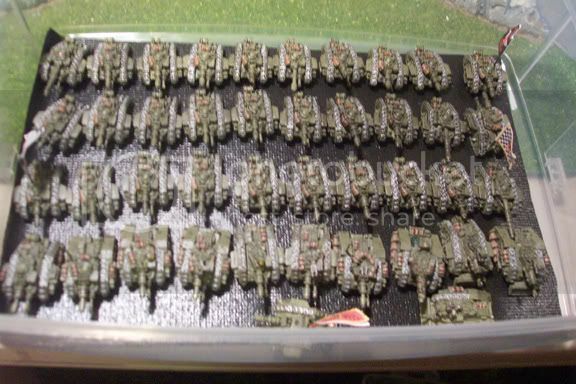 I swung a deal with a guy on TMP and scored 42 Leman Russ tanks for items in trade. 8 of them have broken lascannons, but they just look like heavy bolters now. Here's one company. Three companies of the tanks are the slightly older Mk.III's, while one company is the newer Mk.III's with the track guards. Ah, the heroic banner carriers. 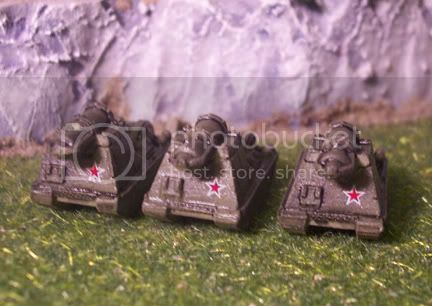 I was going to try to put red star decals on these tanks, but there's so little flat surface area! 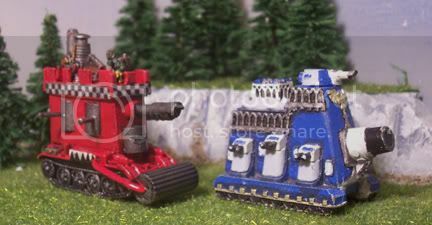 I think I prefer the old Mk.II tanks. 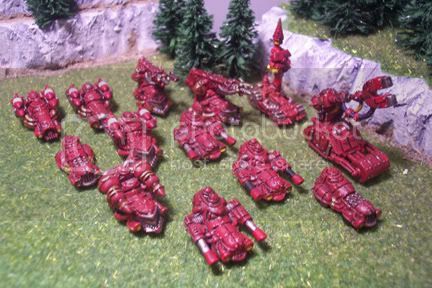 Or the Forgeworld versions, which are beautiful despite being sponsonedly-challenged. I haven't made up any grab-and-go boxes for my IG yet, but I'll get there eventually. 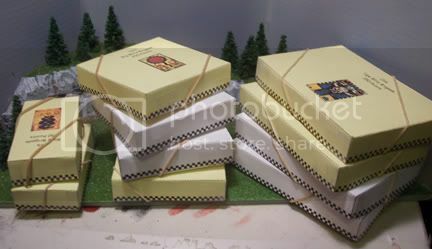 I'm not going to make any for the Leman Russes, though; too heavy for the cardstock. They'll just have to travel in the Snapware. Part of another package trade deal. 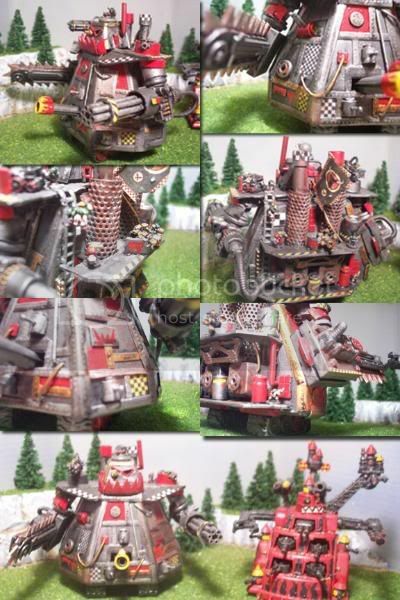 These four old Stormhammers make up the extent of my superheavy capacity (I use them either as Baneblades or as Stormhammers under the "Collector's Models" rules). 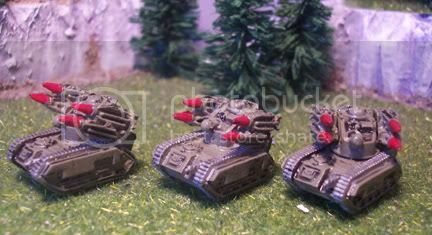 Luckily, four superheavies can inflict significant pain on the bad guys, so my Guardsmen are glad to have these along. Ah, Gorgons. A combat engineer vehicle if ever I saw one. 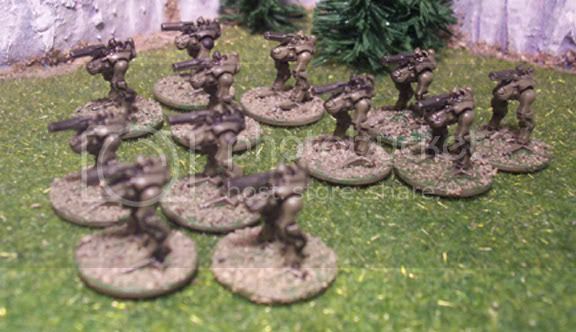 I got these twelve as part of a trade on Bartertown for some 28mm sci-fi resin. 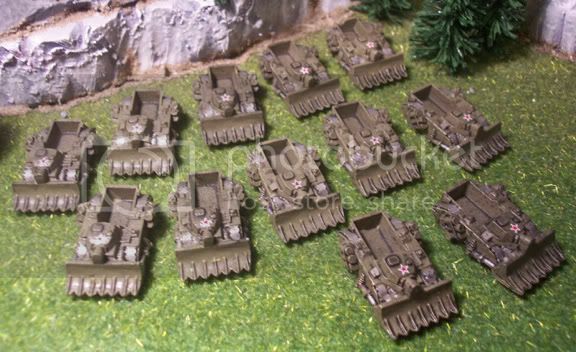 I don't have any Chimeras, so if my Guardsmen want to ride, then these are their hoopties. I'm still working out the math on these. Technically, an IG infantry company could fit in three Gorgons, except for the commander. 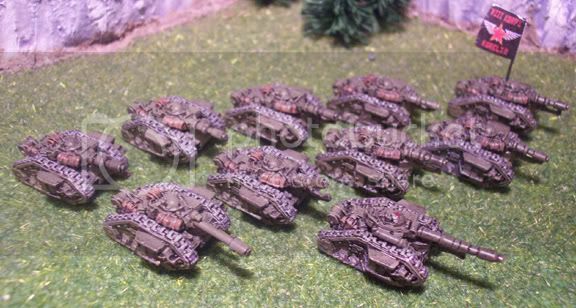 So, I need to get at least a couple Chimeras for the commanders to ride in. Otherwise, it's a fourth Gorgon for them. That wouldn't work out too badly, though, as I could also fit in a robot with the commander. I have the old IG assault troopers, jet pack and all, so those have naturally become my Stormtroopers. 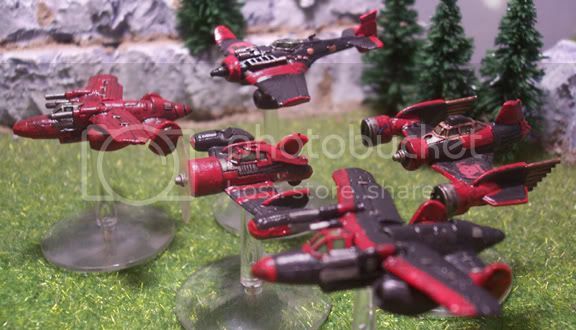 As I've said before, being infamously thrifty, I have yet to shell out any bucks for Valkyries. 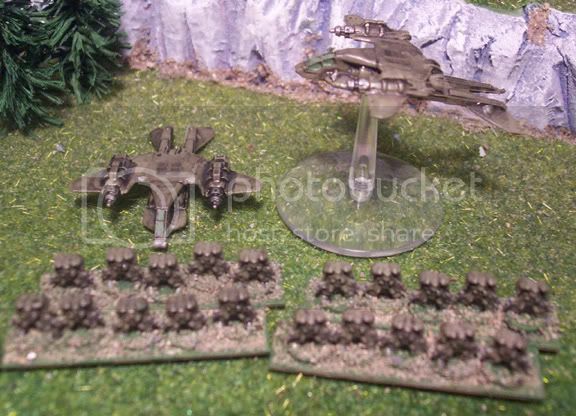 Instead, I'm using Reaper CAV Fenri dropships. However, I only have two right now, and I need two more, so some CAV Ghasts will be playing the part of the Fenri for tonight's production. It's a proxy-squared, or something; a proxy of a proxy. Yeah. Say what you will, I like the IG robots. I plan on using them under the collector's models rules, and chance the consequences! And of course we have the famous Eggs on Legs. But they came with the boxed set, and I'd rather use them than go buy new ones from GW. I live for the "Counts as..." rule. 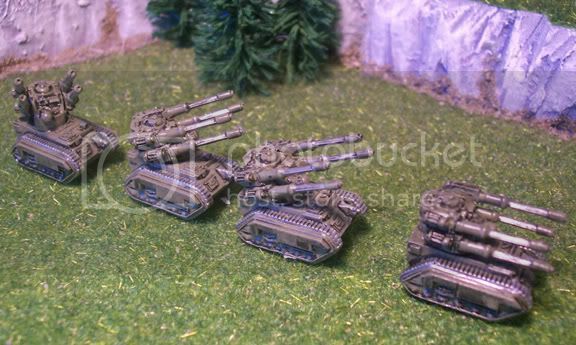 Yes, these aren't autocannons, but I like 'em just the same. 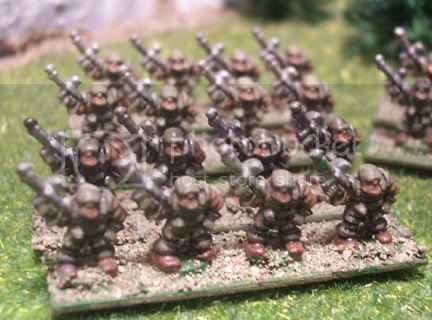 The Thudd guns came already glued down, with Squat gunners next to most of them. 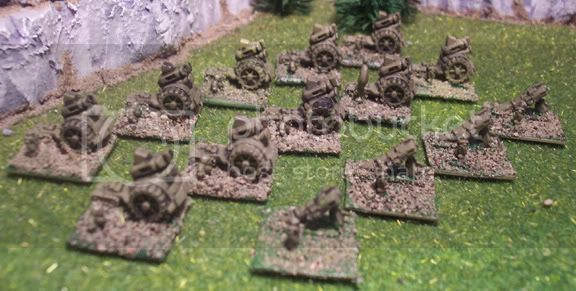 I also never really cared for "mole mortars", so I turned mine around and made them into conventional mortars. Yeah, I'm pretty original that way. 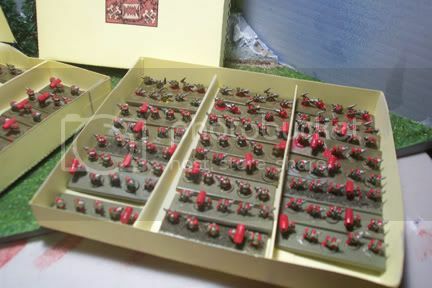 By the way, if you can see the round bases of my individual troopers, it's because they're based on Litko Aero .8mm plywood bases. 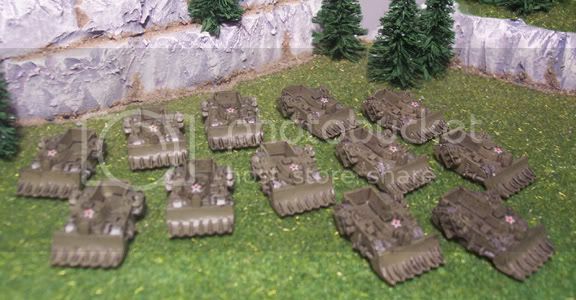 I didn't have any of the Epic 10x40 bases, so I ordered a bunch from Litko. 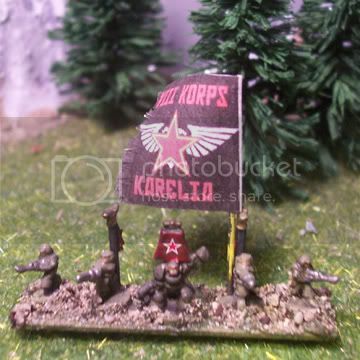 I need to add a red dot to these guys' hats or something, to keep with that Soviet theme. I love the generous detail on the Ogryns; it really picks up a wash well, even for a non-painting no-talent hack such as myself. These came to me through a swap on RPG.net. I like the old-style Bombards, although I think my favorite IG artillery piece is the Griffin. 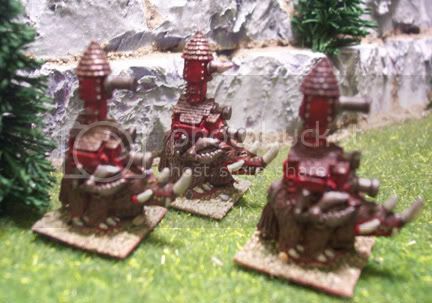 And for all your Gargant-killing needs, consider our top-of-the-line Deathstrike missiles. I would have preferred the buzzbomb-style ones, but hey -- cheapskates can't be choosy. The nice thing about these is that the detail is nice and deep and takes a wash really well. Okay, now, the thing with Commissars is: you need up to 12 of them, in case your IG player gets lucky with his 2d6 roll during force set-up. Now, I don't have two dozen stands' worth of spare IG infantry, so instead I based these guys individually. 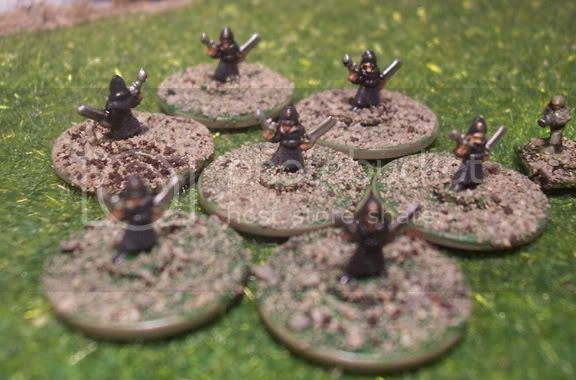 They're kind of like 3D specialist markers, to let you know that a formation has a Commissar attached. If you look really closely, you'll see that the third guy in from the left has "комиссар" written on his hat badge. No, really. I had a Space Marine captain handy, so I threw him on a base with a couple riflemen and a couple guidon bearers. Then I added a banner on spring-steel wire. I'm planning on adding a second banner, to make this commander look extra-supreme. I made a trade (I think on Bartertown) that included a bunch of FW stuff. I love FW's stuff; it's so much cleaner and more finely detailed than the GW minis. More Forgeworld goodness. These Hydras were actually of the towed-implacement variety, and, in a brilliant flash of luck, the trade also included four Trojan prime movers. I removed the detail from the top of the Trojans with my trusty vorpal Xacto knife and drilled in a slight depression for the nub on the bottom of the Hydra cupola. 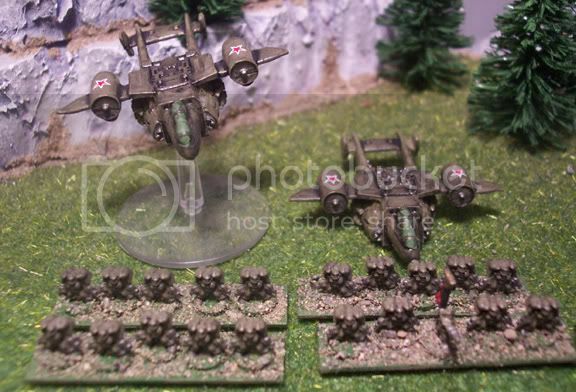 Worked out just fine, even if they do ride a wee bit higher than the standard self-propelled Hydra. Ah... landed this baby for $10 just a couple of weeks ago. Always nice to have a mobile command post handy, especially one that mounts a cannon which can fire a bloody Volkswagen across the battlefield. 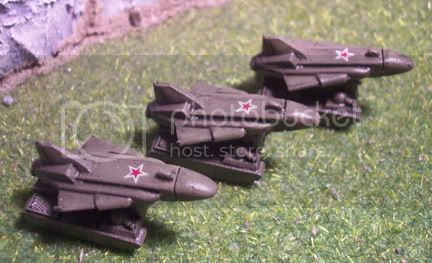 The difficult decision with this one was how to paint all the beautiful detail but still stay true to my drab Sovietesque theme. So, I gave it a coat of solid OD green and put my faith in a heavy black wash to pick out the details. I think it turned out pretty well, considering. 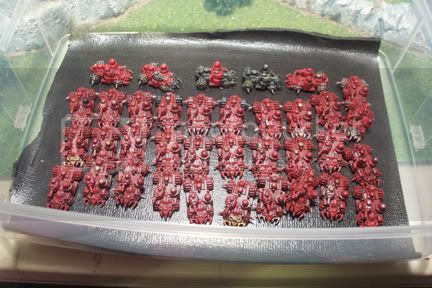 I've been working on flocking the hundred-plus stands of Ork infantry sitting on my workbench, so once those are done, I'll start posting some pics of them, including my Warbosses. 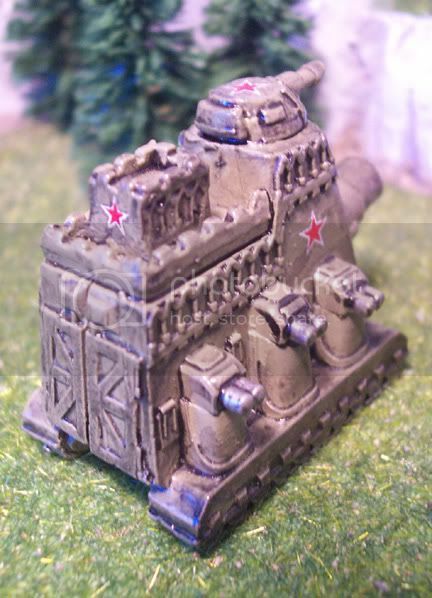 On Karelia, the MINIS paint YOU. I'm not sure what that means, really. But it's the best I could come up with on a Saturday morning. Another brief interlude: Introducing my Dystopia Dice Tower. The answer, of course, is yes; otherwise, this thread would have been short and futile. I found that the Platformer pieces really just wouldn't work; too flimsy and fiddly. But the Hexagon pieces worked a charm! The tower is considerably smaller than the other one, and the inside dimensions are pretty tight. Consequently, standard-sized d20's and d12's won't go through without getting stuck at least once. For the 12mm Chessex dice I use for Epic and Starmada, though, it's perfect. The three-way clips left a little claw sticking outwards, so I at first was going to Dremel them off. However, I realized that I could strngthen them by adding some rod. For future information, the claws are 3/32" in diameter; I found some 3/32" "music wire" at my local Hobbytown for not much, and they add a great deal of strength to the tower. Because there's not a single drop of glue in this thing! The detail on the Hexagon kits are quite good. 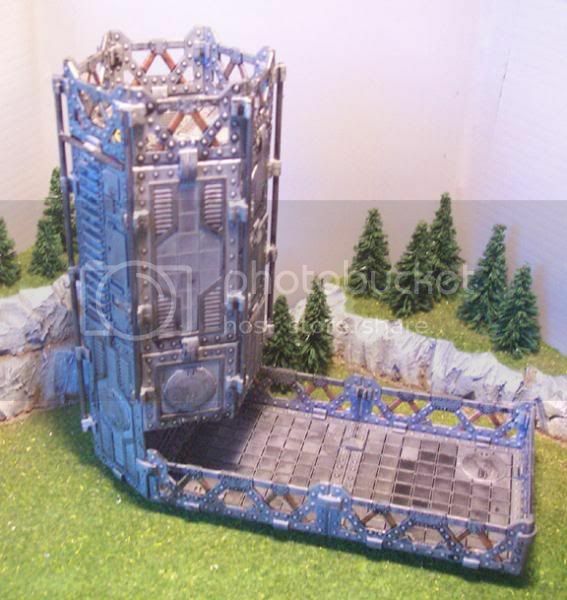 I had a plan to try making a 3D Space Hulk board with these kits, but I like this just as well. So, for smaller dice and a more portable tower (it could even fit inside a larger boardgame box), this is a pretty good solution. 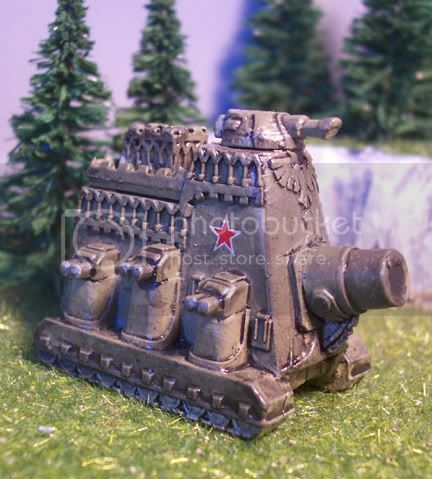 As a plus, it can double as a terrain piece for 15mm and 28mm games! 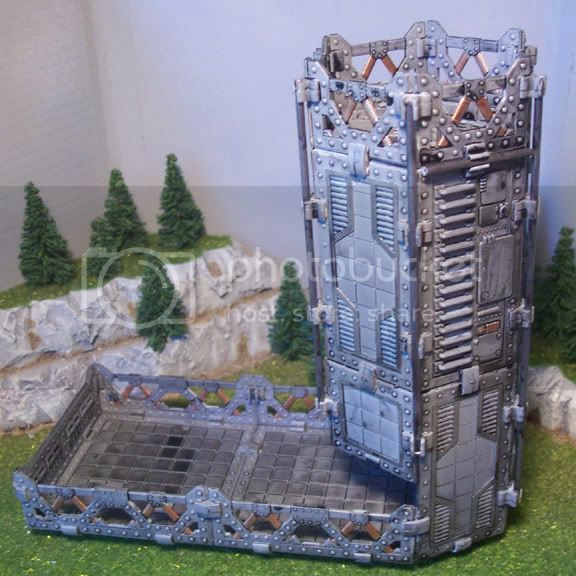 Painting it was simple -- grey primer, highlight details, black wash. Voila -- semi-instant dirty-dystopia-style dice tower. Smexy. Better then what I can do lmao.